Cornbread Suppers: Cornbread Supper, March 8, 2010: Fuig! Our Cornbread Supper tradition is to invite those who bring food to list its contents on little slips of paper, primarily so people with allergies or aversions can be forewarned. 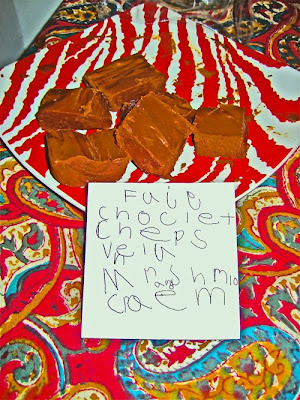 This little slip stood out because of its pre-school author's verve and enthusiasm for the delicious "fuig" she had helped make. Read the contents - you will likely recognize those that are crucial: "choclet cheps," "vnela" and "mrshmlo craem." Exciting to see how participation in a convivial event extends through all ages. We treasure the children who take part.